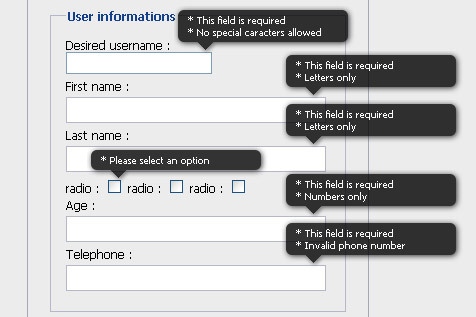 When you submit a form, it will look for inputs with predefined class selectors, and validate them accordingly to their type. It also does on the fly validation when you click outside of the input. When validating on submit , every errors will appear in absolute position above the input in question, and slide the scroll bar to this first error (diminish your browser window if you don’t see the effect). The on the fly validation will validate the modified input when you click outside of the text zone. Localisation language is also available, I already did a (poor) french localisation. Do not include more than one localization at a time in a page. Custom regEx rules with error messages can also be added very easily for you crazy guys that understand how regEx rules actually work.